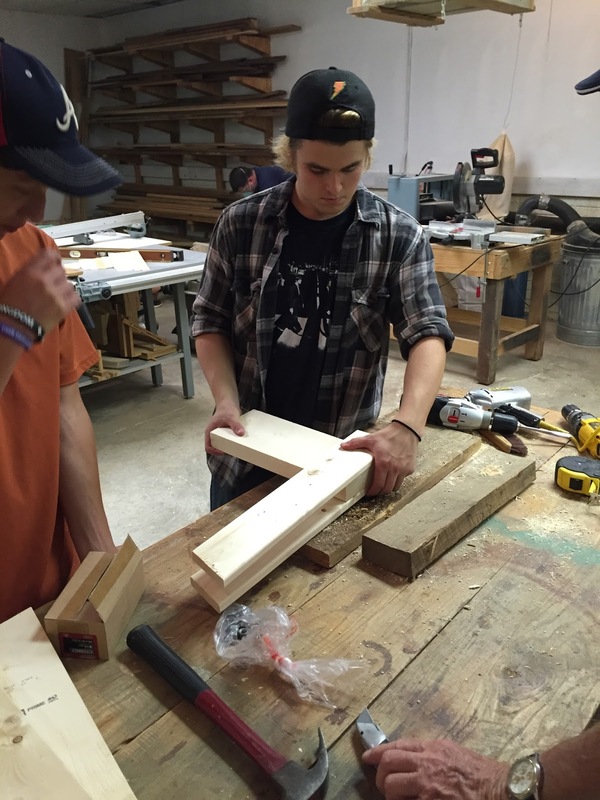 This weekend marked the start of another Troop 50 Eagle Scout Service Project. Will, a Troop 50 founding member and former two-term senior patrol leader, is building "buddy benches" for the playground at the Auburn Early Education Center (AEEC). The concept of a buddy bench at a school, as Will explained to the Saugahatchee District Eagle Board earlier this month, is to help young students overcome loneliness by giving them a designated place to sit with a new friend. Schools have several strategies they can use to foster inclusiveness by using the benches. The concept of a buddy bench is found in other countries but is currently being promoted in the United States by a boy in Pennsylvania who brought the idea to his school principal. His story can be found at http://buddybench.org. On Saturday, Will gathered with a small group of volunteers to begin the construction of the buddy benches for AEEC. Will's research had led to a good design for the benches, which was then modified to make them appropriate for the kindergardeners through second graders of AEEC. Utilizing the tools and woodworking shop of the namesake of our honor scout award, James J. Baird, Jr,. the crew spent most of the day cutting the wood, assembling, and sanding the two benches (along with a short break for pizza). the seat are mounted to the front leg of the bench. 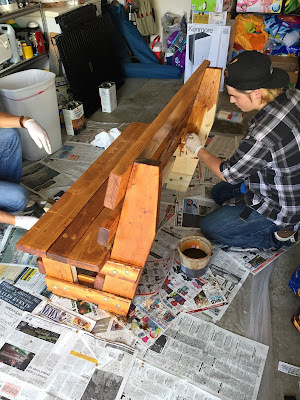 On Sunday, the completed benches were stained and sealed to make them weather resistant. Will also plans to add lettering to the seat backs that identifies them as buddy benches. The color of the letters will mirror those in use by the different "pods" at AEEC. The final part of the project will involve the construction at the school of a permanent anchoring system and the installation of the completed benches. Will works to stain one of the benches in a nice shade of teak. Once the benches are in place, the school should have another great asset for teaching the value of friendship and to encourage cheerfulness. Values that are quite familiar to Scouting. With the completion of Will's project, the troop will have three completed Eagle projects this summer. We now look forward to three new Eagle Scouts for the troop this fall. More photos may be found in the online photo gallery.